Porcelain dental veneers can help you to get the picture-perfect smile. Porcelain dental veneers, also known as laminate porcelain dental veneers, are thin wafers of porcelain that are bonded to your teeth in order to mask smile imperfections such as chips, stains and gaps. Applied by either a general or cosmetic dentist, porcelain veneers have become a popular cosmetic solution because of their natural appearance and durability. Veneers are a popular treatment here at the Chris Mercier Dental Practice, and it's easy to see why. If your tooth imperfections are severe, it may affect how long your porcelain dental veneers procedure takes. The same applies for the types of porcelain veneers you choose. Veneer case by Chris Mercier. This is the stage where you discuss your smile goals with your dentist who will then examine your teeth and devise a dental treatment plan specifically for you. If multiple veneers are considered a wax up of your smile is normally completed to allow you to see the final result before you make a final decision. This process sees your dentist removing part of the tooth in order to make room for the new veneer. A mould is then made of your teeth and sent to an off-site laboratory where your custom-made veneers are created. Some brands of porcelain dental veneers require more preparation than others. 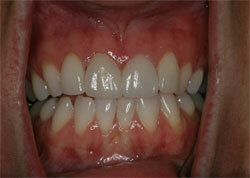 While your new veneers are being made a set of temporary veneers will be fitted and adjusted in your mouth. These temporary veneers are normally a replica of the shape and position of your final veneers, and allow you to see your final result and make any changes before the final veneers are fitted. During this appointment, your dentist will check to ensure your veneers fit well and are the right colour. Adjustments are then made as needed, before your dentist cements the dental veneers into place using a special curing light. One of the best things about modern cosmetic dentistry is having a lot of products from which to choose. Some brands of porcelain veneers require minimal work and some are more stain resistant than others. Television shows such as "Extreme Makeover" and "The Swan" have practically made veneers a household name by featuring Da Vinci Venners™. "Low prep" porcelain veneers, LUMINEERS® by Cerinate®, have also been featured in Shape and News USA. Other well-known brands of porcelain veneers include MACVENEERSTM, Empress® and DURAthin®. Contact us on 0151 709 7948 today to find out more about getting veneers in Liverpool.